The humble Guava fruit is known for its medicinal properties. 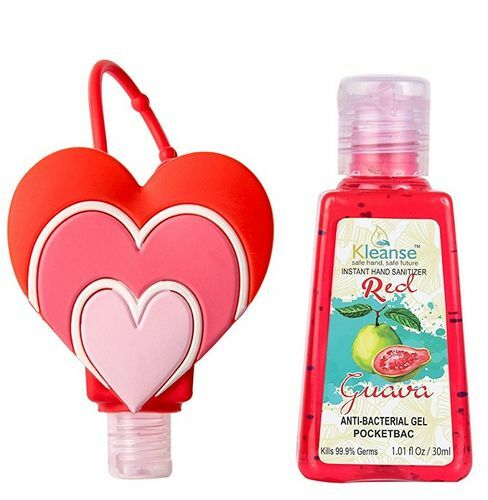 Kleanse's Advanced Instant Hand Sanitizer Red Guava with top note of red guava in the fragrance brings the aroma your regular sanitizer is missing. If you are someone who is looking for a scent that will stay, then this sweetly pungent fragrance hand sanitizer is the right choice for you. Take this wonderful 1.1 oz travel size hand sanitizers bottle holders with you wherever you go for a convenient, easy, and FUN way to help keep the germs away. The holders' has adjustable strap that easily attaches to backpacks, purses, belt loops, strollers and more. Keep loved ones safe and clean by bringing with you to the park, out to eat, sporting events, traveling, or wherever else life takes you.